It's been a crazy, busy month at MemphisWeather.net so I apologize for few blog posts than normal, but I'm grateful for the opportunities that seem to all come together in May! The primary activity for MWN this month has been Memphis in May. A big thank you to CEO Mr. Jim Holt and the operations staff for seeing the wisdom in having a meteorologist on-site when tends of thousands of people are packed into multiple outdoor events during the rain and storm season in Memphis! This was the 2nd year we've partnered and it was again a pleasure to work with great folks who put on a heck of a series in Tom Lee Park each year! They work their tails off literally around-the-clock for the benefit of the visitors. Somehow, despite a very wet month, the weather turned out pretty decent nearly every time the gates opened at the park, if you ignored the mud! In addition, the Memphis Redbirds are well into their 2016 season and MWN is proud to once again be their Official Weather Partner, providing weather updates to operations staff throughout the season. We also officially signed on as Official Weather Partner for Levitt Shell for this year's Orion Free Summer Concert Series and will serve in an advisory and consulting capacity. I'm also proud to recognize Levitt Shell as the first sponsor of the brand-new MWN StormView Radar that was launched this month! If you haven't checked it out yet, please do! There is even a video tutorial on how to use the new features. Thanks Levitt Shell! And be on the lookout for StormView Radar on the video boards at the Shell if inclement weather threatens a concert! 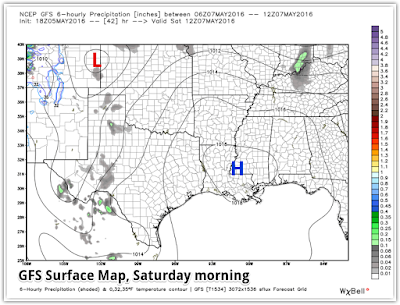 An early summer pattern has set in as light southerly flow wraps around high pressure in the southeastern U.S. This results in humid and unstable air over the region, susceptible to passing upper level disturbances producing widely scattered thunderstorms. For most, today will be dry, though there is a small threat of a few showers late this evening as one of these disturbances moves across AR, producing a cluster of thunderstorms that weakens as it nears the metro after dark. 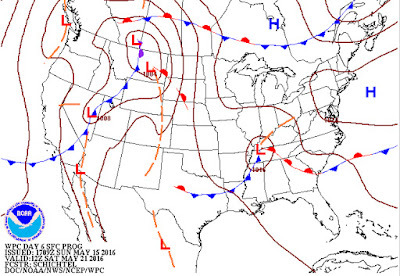 For Memorial Day, weak high pressure builds closer to the region from the north and a weak cold front slides to our east. As wind shifts to light northerly, slightly drier (less humid) air works its way into the region by afternoon and thunderstorm chances diminish even further. Temperatures should climb near the 90° mark under partly cloudy skies, making for great pool weather. 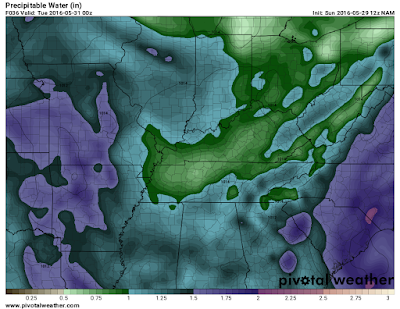 Precipitable water values (PW) show the amount of total moisture in the air over a particular location. Lower PW values (drier air, in green) will work their way into the Mid-South by Monday afternoon, pushing more humid air (purples) west. Tuesday will be much the same with slightly less humid air, weak flow at the surface, and similar temperatures and sky condition to Monday with a very small afternoon thunderstorm chance. As a cold front moving out of the Plains gets a bit closer to the region on Wednesday, southerly flow is re-established and the air becomes more unstable and humid again. A few more thunderstorms are possible Wednesday, especially in the afternoon and west of the metro, though chances remain only near 30%. Total precipitation projected by the GFS (American medium-range) model between 7am-7pm on Wednesday. An approaching frontal system will cause increased rain chances mainly to our west, though a few showers or thunderstorms will be possible in the Mid-South by Wednesday afternoon. 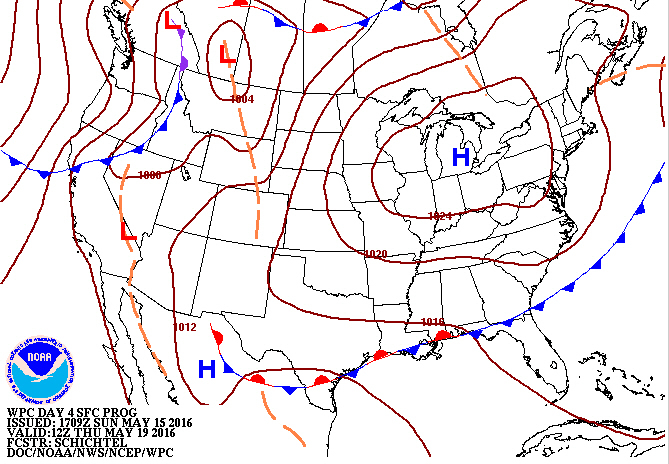 By Thursday, the cold front moves into the Mid-South. Scattered thunderstorms are expected as the front interacts with an unstable airmass. With a bit more wind support at the upper levels, a few storms could become strong to severe with high wind at the surface and perhaps some hail the main threats, in addition to heavy rain. 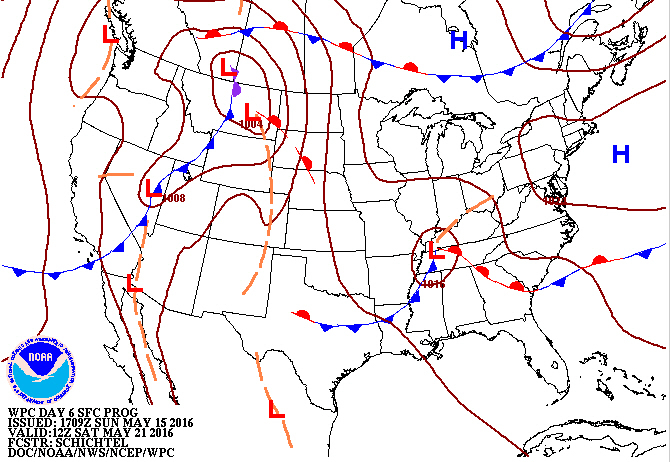 The front creeps south into Friday, so rain and thunderstorm chances remain in the region to end the week. The elevated rain chances will also serve to keep afternoon highs in check with low to mid 80s expected Thursday and Friday. 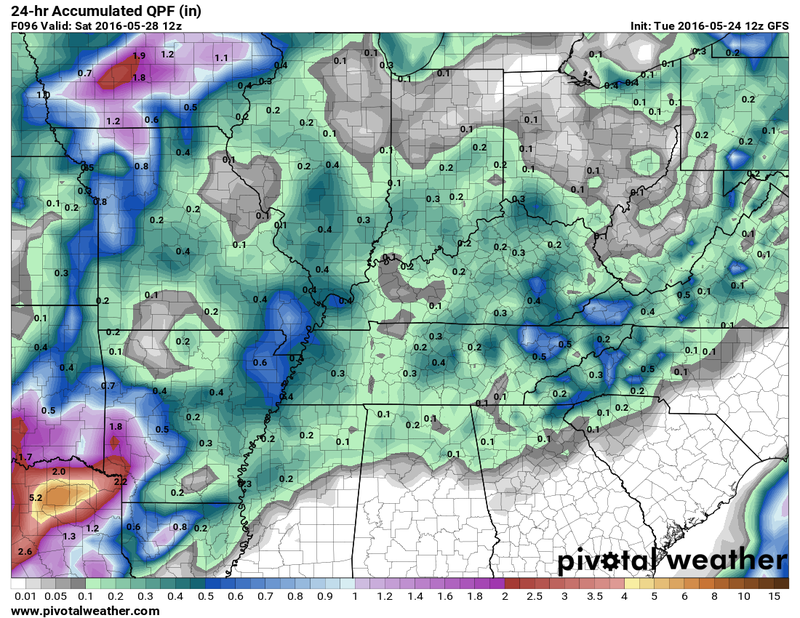 Total precipitation projected by the GFS (American medium-range) model between 7pm Wednesday and 7pm Friday. 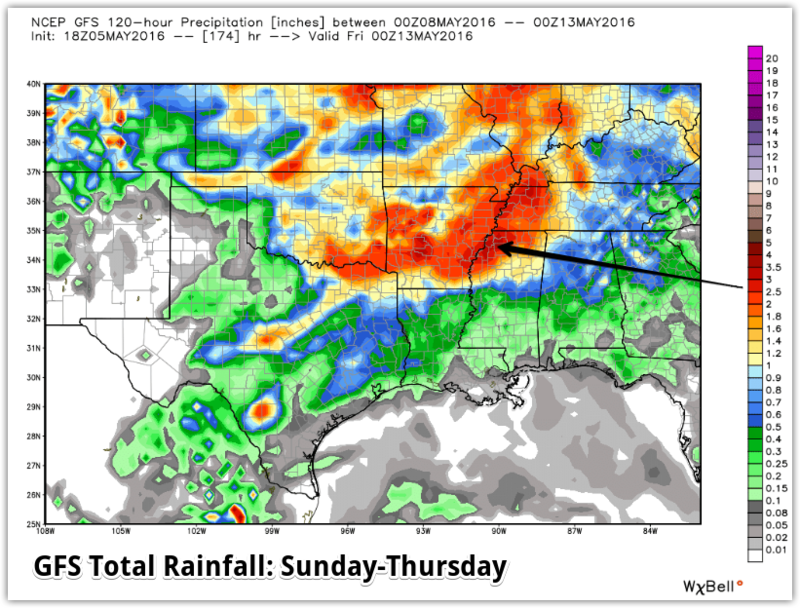 As the cold front slowly inches through the Mid-South, scattered to widespread showers and thunderstorms will be possible Thursday and Friday. Rainfall totals will likely be higher over western sections of the region. The cold front stalls not far to our south next weekend it appears, so rain chances diminish but could still be possible, especially across north MS. Cooler air also filters into the region with highs next weekend in the lower 80s at best. It appears the below average temperatures (normal is 86-87° in early June) could continue into early the following week with a drier pattern setting up as well. 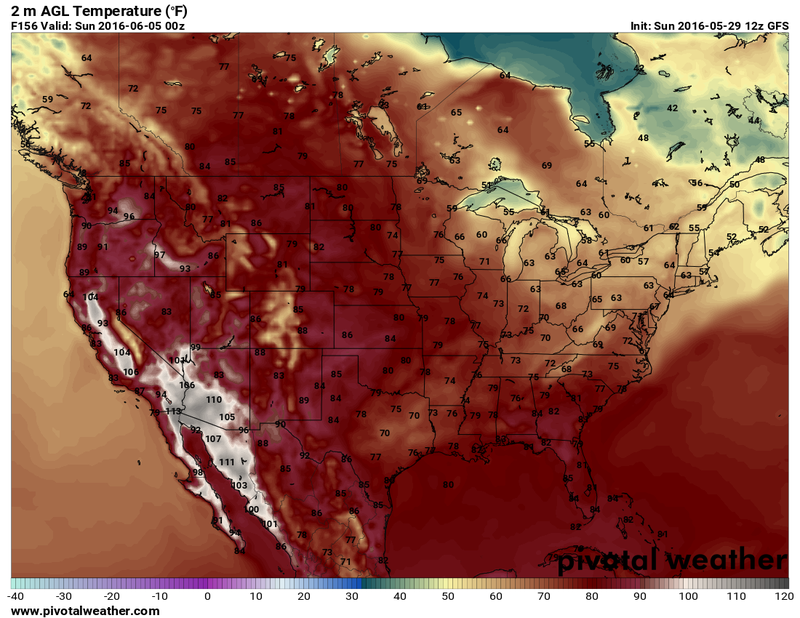 Surface temperatures at 7pm Saturday as projected by the GFS model. 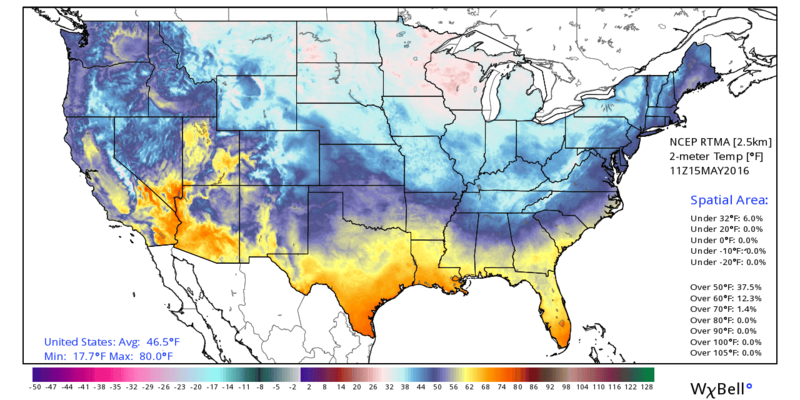 Note the cooler air (60s and 70s) over the eastern U.S. At this time, we are expecting highs near 80 on Saturday with mid-evening temperatures, as shown here, in the mid 70s. 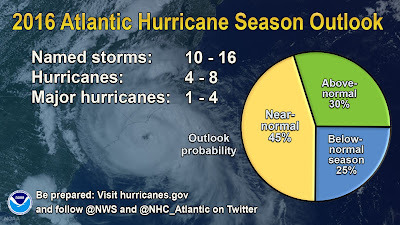 Atlantic hurricane season officially starts on Wednesday, but Mother Nature again showed how the calendar means little. 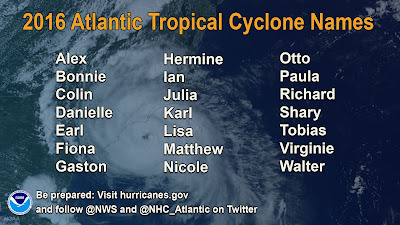 By the time June 1 rolls around, the next named storm will start with the letter "C" thanks to a surprise appearance by a very rare January hurricane in the eastern Atlantic (Alex) and an early bloomer in disorganized Bonnie, which made landfall today on the SC coast as a tropical depression (but received the name Bonnie on Friday as it reached tropical storm strength). Late Sunday morning update on Tropical Depression Bonnie, after landfall on the central SC coast earlier in the day. Bonnie will slowly re-curve up the Carolina coastline for the next few days with heavy rain being the primary threat. 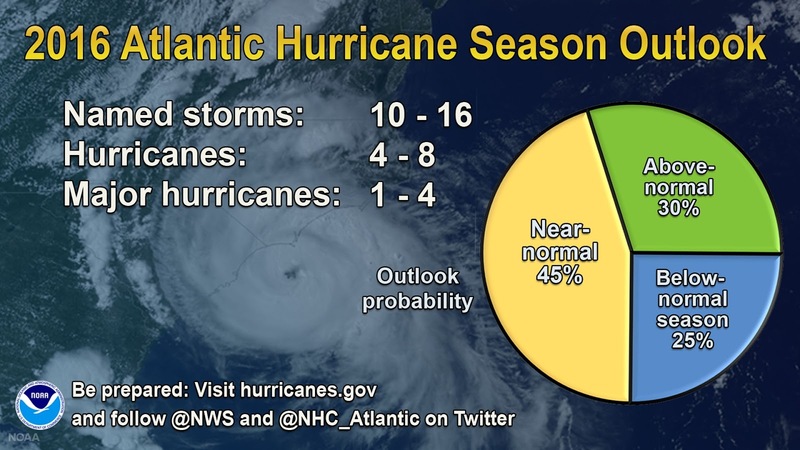 Officially, NOAA and the NWS predict a season "near normal" in the Atlantic Basin after a quieter than average last 3 years. The official prediction is shown below, which has a 70% likelihood of occuring. El Nino is dissipating and La Nina is becoming more likely during the peak of hurricane season, which tends to favor elevated Atlantic activity, though it is unknown how strong La Nina will get during hurricane season. 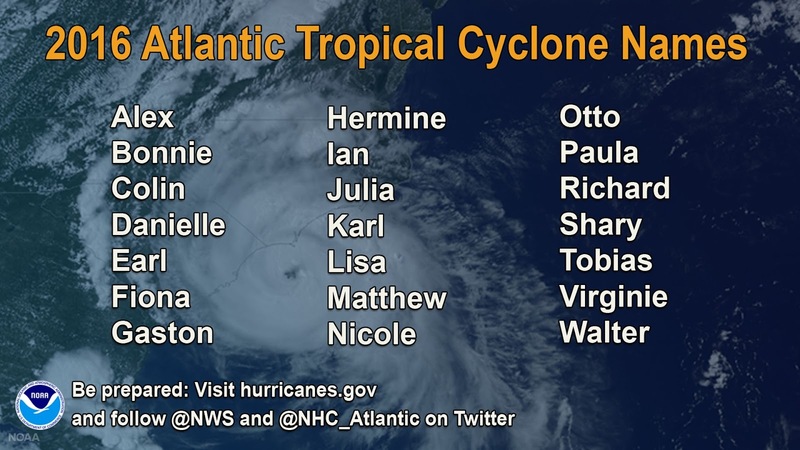 With an unprecedented 10 years (3,870 days to be exact) having gone by since the last major hurricane to make landfall in the U.S. (Wilma in late 2005), the NWS is preaching "It Only Takes One" to drive home the point that no matter how many storms are named, one landfall can cause a significant impact. A lot has changed on the U.S. coastlines since 2005, including burgeoning populations and a new generation of residents and retirees that have never experienced a hurricane. Think about it - when Wilma made landfall in southwest Florida in October 2005, the iPhone and Twitter had not been invented and Facebook was less than 2 years old! There is some concern this year that, due to warmer than average sea surface temperatures near coastal areas, any system that has favorable atmospheric conditions could strengthen as it approaches landfall, and indeed may form closer to land, providing for less lead time as residents and businesses in harm's way prepare. It will be an interesting season to watch play out. Early summertime weather pattern is here! What about Bonnie? 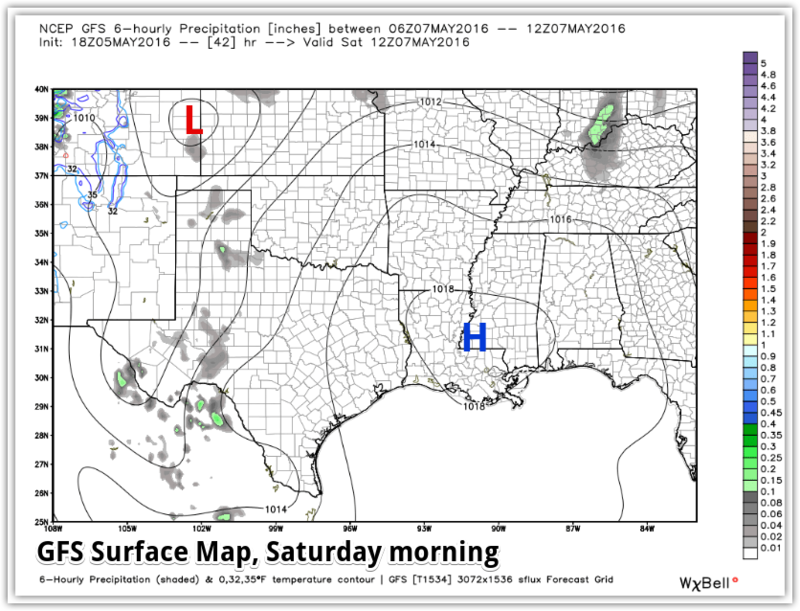 The atmospheric patterns have shifted, changing from very pleasant and dry weather over the weekend to a more humid and warmer setup with increasing chances of thunderstorms, more akin to early summer. 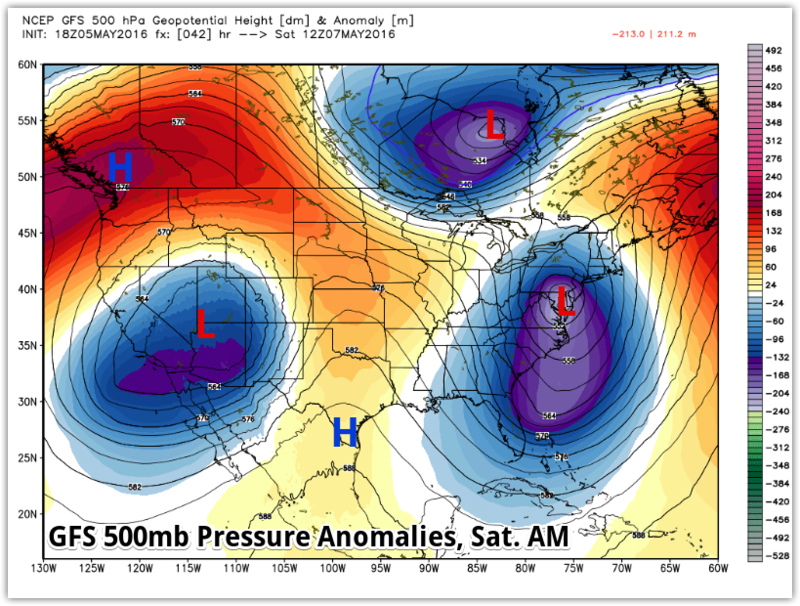 At the upper levels, which drives how the rest of the atmosphere behaves, a large ridge of high pressure extends from the Southern Plains northeast towards the Great Lakes and is shifting east into the eastern U.S. 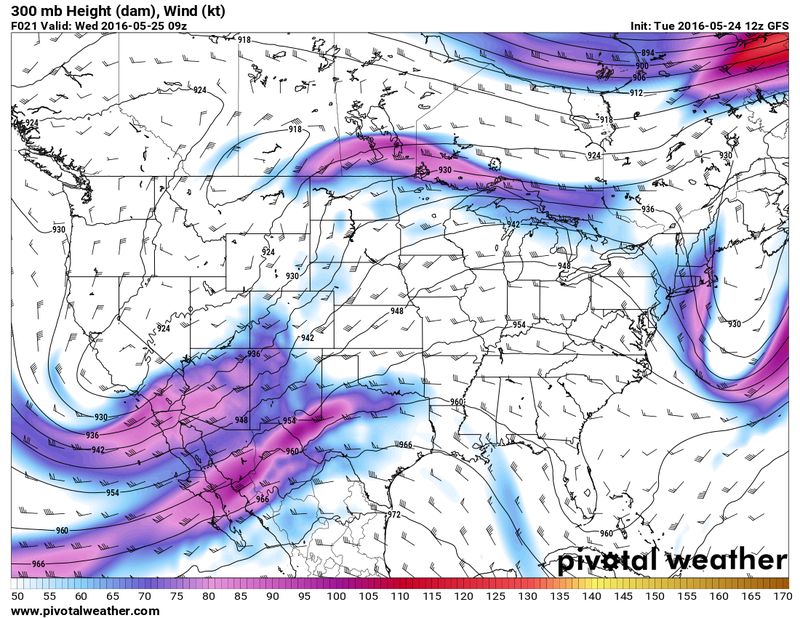 Meanwhile, a large scale trough over the western U.S. will also push east into the Plains by this weekend. 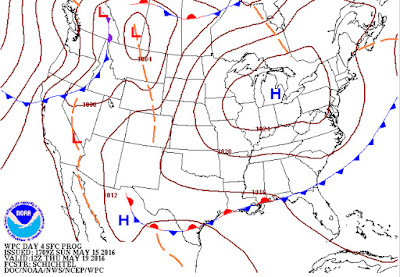 As of Tuesday evening, a ridge of high pressure at the upper level (30,000') (which looks like a hill in the black contoured lines above) is situated from the western Gulf Coast towards the Great Lakes, causing weather systems in the Plains to move northeast around the ridge and somewhat protecting the Mid-South. The mid levels respond with a high pressure ridge building briefly over the Mid-South for the middle of the week before moving east, as southerly flow ahead of a mid-level trough of low pressure also moves into the Plains. By later in the week (Friday night, as shown), the upper level ridge shifts east and the mid-levels (18,000', shown here) respond with southerly air flowing into the region as storm system are allowed to get closer to the Mid-South with the ridge shifting east. Finally, near the surface, the Bermuda high pressure cell maintains its grip on the southeastern U.S. with the Mid-South positioned on the western periphery of it. Lower pressures dominate the Plains. Near the surface (5,000'), the Bermuda High (high pressure centered over the southeastern U.S. coastline), keeps weather systems from intruding too far east. Being on the periphery of the high, the Mid-South sees increasing chances of rain from east to west, with areas west of the Mississippi River having higher chances than those of us east of the river. Overall, this setup favors a southerly stream of warm, Gulf moisture-laden air into the Mid-South, which is increasing our humidity levels, as well as a stormy pattern (including some severe weather) to our west. As those storm systems encounter higher pressure east of the Mississippi River, they move northeast, up the west side of the ridge. We're left in the middle - with an active pattern to the west and dryness to the east. 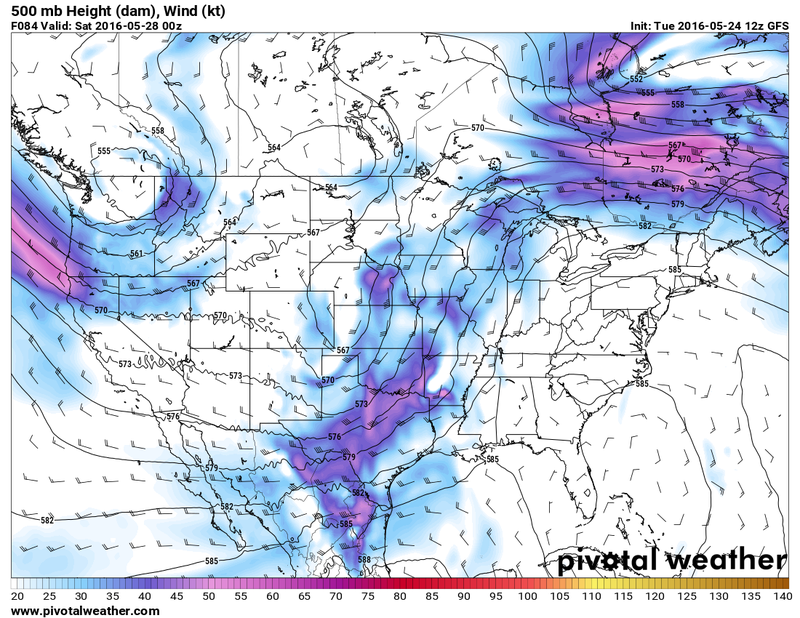 Occasionally the systems to the west brush the area and bring us thunderstorm chances, but those are hard to determine more than 24-36 hours out which will fall apart as the encounter the ridge to our east and which will bring elevated chances of thunderstorms. Thus we are left with low chances of thunderstorms each day, some of which may not actually materialize and some which could bring a strong storm or two, as well as localized downpours! 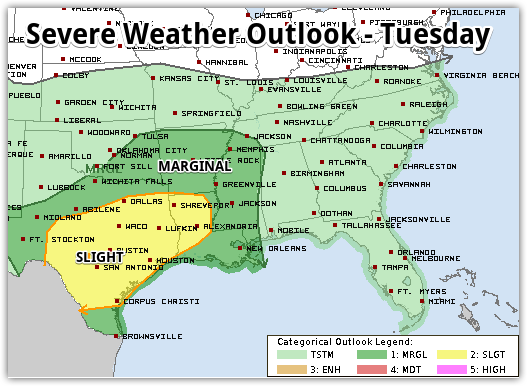 It appears the best chance of more widespread storms in the metro may be in the Thursday night to Friday night time frame as the Plains trough is able to move into western parts of the Mid-South before high pressure re-builds heading into the weekend. Total rainfall from Friday morning to Saturday morning according to the GFS model is nearly 0.5", so rain chances are expected to be higher to end the week before they fall again heading into the weekend. There also are some indications that this afternoon's storms just to our north could build south, or send out an outflow boundary that results in the formation of new storms closer to the metro this evening. Stay tuned to our social media feeds for the latest on this possibility. 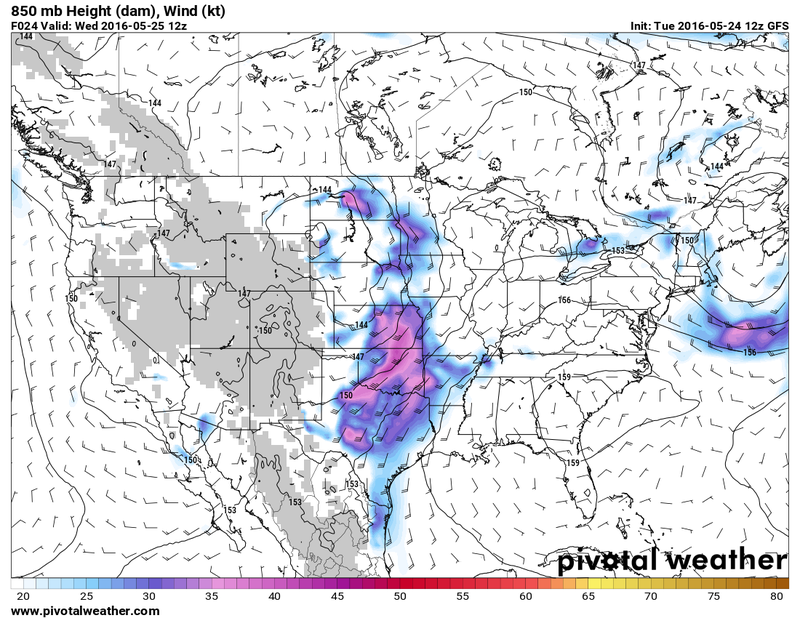 Most models are firmly opposed to the idea, so we'll see! 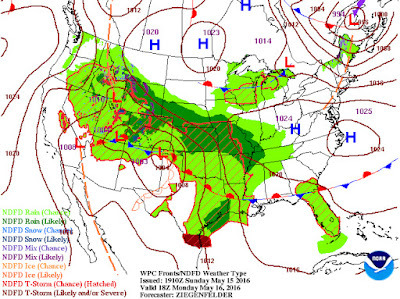 Get our latest thoughts via the MWN Forecast. Heading into the weekend, as mentioned, high pressure begins to build once again, reducing rain chances to low end "chance" possibilities, as a possible tropical or subtropical system develops off the southeast U.S. coastline. Atlantic hurricane season begins next Wednesday, but with Alex having developed in January, Mother Nature may not wait until June 1 to throw another named storm our way! 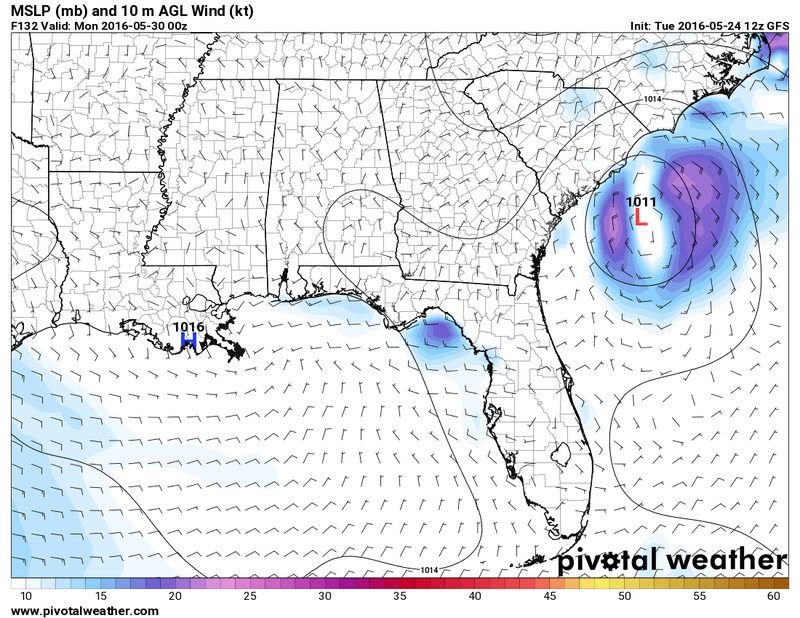 The American GFS model projects an area of low pressure over the Gulf Stream off the SC coastline on Sunday evening. Could this end up being Tropical Storm Bonnie? Finally, you may know that we rolled out a brand new version of MWN StormView Radar on Sunday night. We've gotten lots of positive feedback on the new interface, features, and mapping! You'll get the full "interactive" experience on the desktop version of MWN, but the interactive version also works on mobile (the previous one did not). We also have a dedicated mobile version with 3 different zoom levels available via MWN Mobile. The new radar map also appears on the MWN mobile apps. For more on how to use the interactive features, check out this video tutorial I put together. I also must offer a big "Thank you!" to our inaugural sponsor of the new and improved StormView Radar, Levitt Shell! If you haven't taken in a free summertime, family-friendly concert at the Levitt Shell at Overton Park, plan to do so this year! And if you have, you're in for a whole new experience as the Shell has been completely renovated to enhance the patron and performer experience! 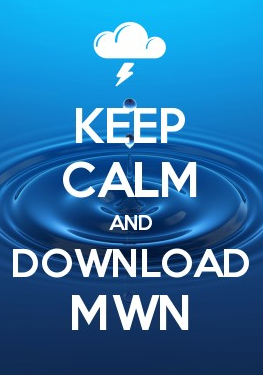 We'll be keeping an eye on the weather for this summer's concerts as MWN is the Official Weather Partner of the Shell. You might even see StormView Radar on their video screens during one of your visits! Thanks Levitt Shell for a great partnership! A record wet March was followed by another month with sufficient precipitation, as April ended about 1/2" above normal. Most precipitation occurred on a few select days. Flash Flood Watches and Warnings were issued on the 14th-15th and last couple days of the month. Temperatures continued the above normal trend as well, about 2° above average, based mainly on warm overnight lows. Overall, there were only 7 days that averaged below normal for the month, but most days were within a few degrees of average. Very little severe weather occurred in April with the only reports being trees downed by a wake low that produced 50-60 mph wind on the 30th and injuries at the FedEx SuperHub at Memphis International Airport due to lightning on the 6th. No tornadoes occurred in the entire state of TN in April, a fairly rare occurrence for the peak month of the Mid-South severe weather season. Comments: Six days recorded more than 0.50" of rain and 2 of those received over 1" of rain. This week's weather discussion was presented for the first time on Facebook Live! 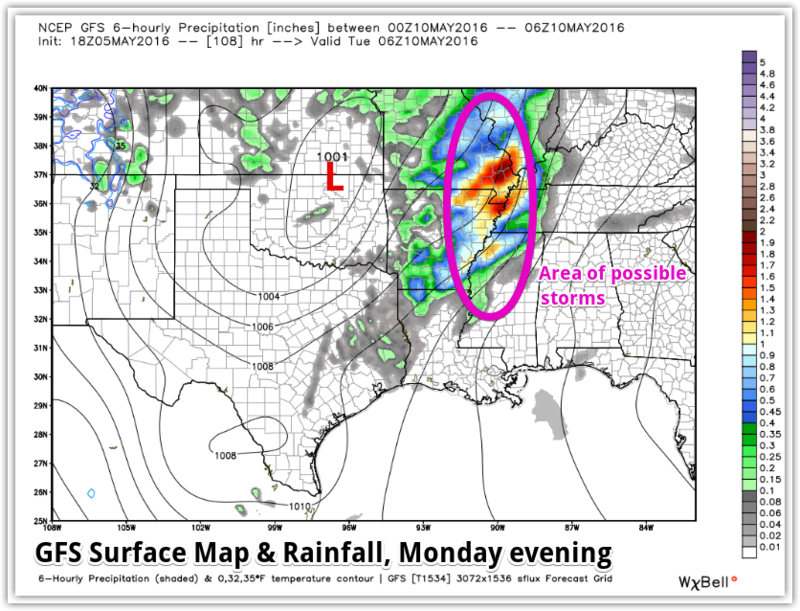 Check out the discussion below or click here to go straight to the MWN Forecast. Twice a year, the remnants of Halley's Comet result in a meteor shower that is visible from Earth. One of those, the eta Aquarid meteor shower, occurs later this week with weather conditions in the Memphis area expected to be ideal as clear skies are expected for the latter half of the week. The best viewing times for meteor showers are in the pre-dawn hours. With sunrise near 6:00am, you'll want to get up extra early for best viewing. The Aquarids peak on May 5-6 (Thursday and Friday) so early Friday morning is the best time to be looking. You'll want to look towards the constellation Aquarius, which is in the east-southeast sky, not too far above the horizon. The northern hemisphere is expected to see a shooting star about once every 2 minutes. The 2016 eta Aquarid meteor shower peaks on the nights around May 5th and 6th. The shower can be seen from both hemispheres, but the southern hemisphere is favored with twice as many meteors as the northern hemisphere--60 meteors per hour in the south vs. 30 per hour in the north. The best time to look, no matter where you live, is during the hours just before local sunrise. The constellation Aquarius does not rise very far above the horizon in the northern hemisphere, and that's why northerners see relatively few meteors. But the ones they do see could be spectacular Earthgrazers. Good luck, make a wish, and let us know if you see any meteors!